Goathland Plough Stots. 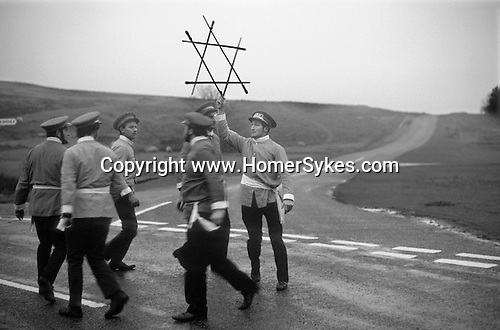 Goathland Yorkshire UK Sword Dance Team 1972.
were the plough stots, with 'Betty' carrying a broom, and 'Old Isaac' collecting alms. The whole procession could number as many as forty people. During the week's holiday they first toured their own village and then the ones near by, especially those that had no team. At various places in each village the sword-dancers performed and a collection was made. Donations were expected and if they were not forthcoming the farmer ran the risk of having his lawn ploughed up. At the end of the week it was the custom to hold a festival and dance, to which the women folk were invited. Expenses were met out of the funds collected during the week and the remaining money divided up between the performers.